Barbara Rink ( Huizen, 1978) makes installations, drawings and paintings. Her recent installations let the moment of transformation, where two dimensions become three, come together through color, material and form. She transforms the physical space into a place of abstraction and imagination with an emotional urgency at its core. Through working with simple and straightforward materials like paper, wood, paint, topics like mysticism, the laws of physics and man-nature relations become apparent. Rink researches what painting can be nowadays, outside of the four sides of the canvas. Rink holds a BA from the Royal Academy of Art The Hague, has also studied at the Hoge School voor de Kunsten Amsterdam and Norwich School of Art & Design. Recent shows have been at BRADWOLFF PROJECTS and Soledad Senlle Art Foundation. 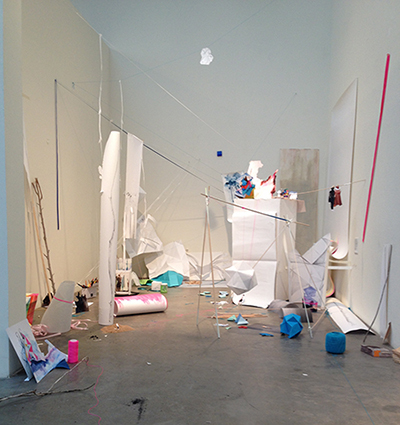 My stay at SFAI (sept/okt 2014) has been very productive and career-changing. The residency opportunity came at a time when I was on the brink of choosing a radically different way of approaching my work; going from flat surfaces to making three dimensional installations. During the residency I had the time to explore this new territory and just experiment and play. I felt very much supported by the staff and the other residents. Through group discussions and talks with invited curators I got encouraged to go boldly in this new direction. The specific geographic location of Santa Fe I found very interesting and informative for my work. The organised tour through Northern New Mexico was, besides a lot of fun, contributing to new ideas. I was lucky to have the opportunity to use part of the presentation space of SFAI to make an installation in, something I could not have done in my studio at home. I was at SFAI only for two months, in hindsight a bit short for the plans I had. I wanted to travel much more in New Mexico, and I wish I did! It is an amazingly beautiful state, socially and historically very interesting. While I was there I also wanted to work in my studio as often as possible. As an international resident you can't use the residents car, only the bikes. Downtown Santa Fe a little too far too walk. You are then dependent on the bus, bike (the city is not laid out with bicyclists in mind!) and the other, national residents. Which some times was a hassle, but not a too big problem. This residency majorly affected my work as an artist. Without it, it would have been more difficult to make such a change and give a boost to my career. I have made new work contacts with artists and curators that hold potential for future work engagements. If I could go back in time, I would take two extra weeks just to travel through New Mexico, before starting the residency. Or go for three months. But other then that I can wholeheartedly recommend this residency. Especially now that they have the thematic residencies there might be more and intensive programming going on for artists and public.